The Afro-Cuban Big Band Play-Along DVD gives the drummer/percussionist an opportunity to play contemporary Afro-Cuban music in a big band setting. Playing tunes from the Latin Grammy-winning group Afro-Bop Alliance, drummer Joe McCarthy focuses on three of the predominant groove categories of mainstream Afro-Cuban music: mambo, cha-cha-cha and 6/8 Afro-Cuban. State-of-the-art camera work gives an in-depth look at Joe?s multi-level approach to playing these exciting rhythms, while his focused, straight-ahead concepts take the mystery out of applying these grooves to the music of today. 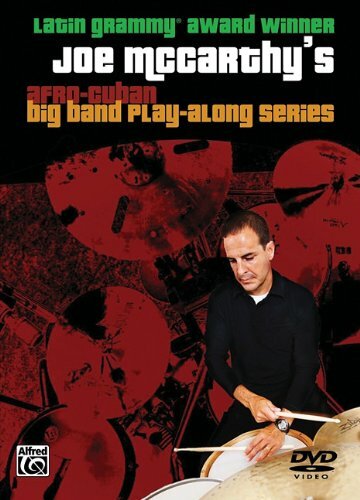 The DVD features play-along tracks (minus the drums), an E-book containing the complete charts and examples demonstrated on the DVD, and bonus tracks of additional tunes from Afro-Bop Alliance.